Yo! What’s up guys? it’s been a while since I posted anything on the site and I feel I owe you an explanation before getting into the topic, well I’ve been working on new music , Videos and side hustle na, man gats work lol anyway I’ve found a way to maximize my time so I can post more often, with that out of the way let’s go to the topic. 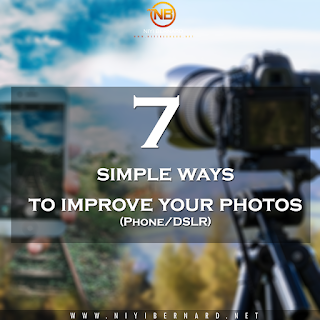 “7 ways to improve your photos” I’ll be talking about the Technics or steps to take before taking the photos but also how to improve pictures you’ve already taken , in no particular order, now I’ll be leaving out things like IOS, Shutter Speed etc. because the topic says “SIMPLE” so let’s keep it as simple as possible, what makes a picture look good or sharp is how much detail you can get, if you’re a guy you want that hairline to pop, the color of your kicks to bang and for the ladies, that eye shadow has to glow! They need to see how sharp your razor blade eyebrows are!! Lol right? So let’s talk. 1. Good Lighting, some people will tell you to get the best phone, best camera blah blah but you see if you have good lighting you can achieve a lot with a mid-range device, so remember to always shoot in well-lit spaces like outdoor, when the sun is shining, that’s usually the easiest and cheapest light you can get that gives good results, mess around with the angles and find what works for you ,unless you’re trying to get a particular tone or depth in your pictures then the sun might not be the best option but that’s a more advanced topic mehn, not this lol. 2. Stabilization or stable hands or no shaking or whatever lol you get the point, try as much as possible to keep your device still while taking a picture to avoid blurry images, when the device is really stable you make it easy for it to focus on what’s important, think of the camera/phone like your eyes, imagine moving round, it’s really hard to focus on one image and all the colors/objects starts to fade and merge together, you lose detail! So keep your device as stable as possible, you can get a tripod or a selfie stick, it’ll make things easier. 3. Device, now I know in (1) I said “some people will tell you to get the best phone, best camera blah blah” but remember I said “you can achieve a lot with a mid-range device” so get something mid-rangy lol you get my point? Doesn’t have to be too expensive but check the specifications and make sure it’s at least average. 4.Brightness/contrast, so this is after the picture has been taken, maybe you don’t like the way it looks, you think it needs to look sharper, your nose is shining too much, all that and you want to mess with it in editing, be careful when messing with the brightness/contrast, now I see most people blast up the brightness when they think the picture needs more light but you have to be careful, every percentage (or however the brightness on your app/software is measured) of brightness reduces sharpness from the picture, which means the more you increase the brightness, you lose detail and with contrast the more you reduce you lose detail and when you increase you gain depth but lose light so too much of any isn’t good! This brings me to the next point. 7. Color or Temperature, this is really simple, the color/temperature of your picture can make a big difference, a tint of blue will usually give it that cool calm feel, this is really your choice, depends on what you’re going for, have fun with it. If there’s anything you know that I didn’t mention or you think I said something wrong feel free to drop a comment, we’re all here to learn!